In short, Clinical Hypnotherapy involves the use of hypnosis for the purpose of therapy which, by the way, is somewhat different to using hypnosis for entertainment! Hypnosis or "trance" as it is sometimes called, is a totally natural state of mind that we all experience frequently without being aware of it. Most of us have had times when we seem to have "tuned out" to our surroundings or lost track of time, such as when we are totally engrossed in a really gripping book or movie or when we almost miss our exit on the freeway because our mind was "elsewhere". These instances are in fact experiences of the "hypnotic" state. During hypnotherapy as your focus shifts from the outside world and you gain a heightened sense of internal awareness, it usually feels quite effortless to concentrate on almost anything you wish to. You and your therapist will be using this heightened sense of awareness to help you to explore and resolve aspects of any issue that has been troubling you. Hypnotherapy is not a "cure-all" but it can be a very effective method of therapy for a great many issues where psychological and emotional factors are involved and most people find that hypnosis is a very comfortable and relaxed state during which they can experience an astonishing sense of clarity and well being. There is a huge amount of experiential evidence that hypnosis works but nobody can explain scientifically exactly how it does. A study conducted by researchers at the Stanford School of Medicine in 2016 identified distinct areas of the brain related to perception and mind-body communication that are altered during the hypnotic state.The researchers used brain imaging to see what was actually happening to people while they were under hypnosis. The images captured the regions of the brain that were most and the least active while the participants were hypnotised. The research team noticed the following changes in brain activity. They saw decreased activity in a region known as the dorsal anterior cingulate cortex: this part of the brain helps us to evaluate our context and to decide what to worry about and what to ignore in a particular situation. Reducing that activity indicates that during hypnosis we are able to suspend judgement and immerse ourselves in something, without thinking of what else we could or should be aware of. The second change appeared in some of the parts of the brain that give us the ability to separate the thoughts in our heads from the feelings in our bodies. According to the study's senior author, Stanford psychiatry professor David Spiegel, people in hypnosis "can picture something that makes them stressed, but they can imagine that their bodies are floating and comfortable.” This can enable us to have better control over how we react and respond to stressful and/or anxious thoughts. The third region affected is located very deep in the brain and involves self-consciousness. According to the researchers, we tend to be less self-conscious during hypnosis. In a hypnotherapy context, this can help us to approach issues and problems in a different way than we otherwise might allow ourselves to do. The outcomes of this study do seem to highlight the potential we have to create change via this absorbed state of mind during which we are more easily able to accept helpful suggestions as "obvious" rather than "doubtful". Extensive EEG research has also demonstrated that the brain produces different brain waves and rhythms of electrical voltage, depending on its mental state. Brain wave frequencies during deep sleep are different to the freqeuncies that can be measured during dreaming and your brain wave activity when you are fully alert is quite different to your brain wave frequencies during relaxation. EEGs from subjects under hypnosis show a boost in the lower frequency waves associated with dreaming and sleep, and a drop in the higher frequency waves associated with full wakefulness. Brain-wave information is not a definitive indicator of how the mind is operating, but this pattern does fit the hypothesis that the "conscious mind" backs off during hypnosis and the "subconscious mind" takes a more active role. The similarities between the hypnotic or "trance" state and REM (Rapid Eye Movement) sleep state have been well documented and thanks to extensive and compelling research completed by psychologists Joe Griffin and Ivan Tyrell, into how the brain maintains or updates its "programming" during REM sleep, we now have a much better understanding of why hypnosis (which is, in effect, an artificially induced REM state) can be such a powerful learning state of mind. The only honest answer that a responsible hypnotherapist can give you to this question is "I don't know". Having said that, the vast majority of people are able to achieve at least a light state of hypnosis which can be enough to be able to achieve a positive outcome. Remember also that your ability to enter the hypnotic state will also depend on the level of trust and rapport you have with your therapist so do ask as many questions as you need to feel as comfortable as you can with the person and the process. If you haven't been to a hypnotherapist before, it is totally normal and OK to feel a little apprehensive at first but rest assured that this feeling will pass very quickly as the therapist helps you to feel more and more at ease. I find it difficult to relax - is that going to be a problem? 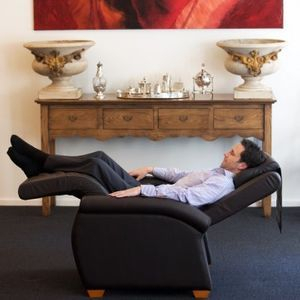 Your comfort and well being are of paramount importance and having helped you to feel at ease by answering any and all questions you might have, your ability to achieve an optimal level of physical relaxation is greatly enhanced when you sit back in our zero-gravity recliner. Based on technology developed by NASA, whose scientific research had shown that the zero-gravity position minimises the huge gravitational stresses astronauts experience during take-off, the health benefits of this position are now recommended by many healthcare professionals. The effects of this reduction of muscular tension in the back, easier breathing and higher oxygen levels in the blood are instantly noticeable: zero-gravity reduces stress on the body and creates a state of deep relaxation even if you usually find it difficult to relax! What is hypnosis like? Will I be asleep? Who controls my mind? When you are hypnotised you are not asleep: you will feel very relaxed but at the same time you are in fact mentally quite alert. True, you are in a "hypnotised" state but it's very similar to the daydream state we all slip into quite easily and quite often. As for the issue of "control", the idea that a hypnotist has "power" over a hypnotised person is associated with Hollywood movies, pulp fiction and stage hypnosis performances and has no place in an ethical and professional therapy process. A competent hypnotherapist will be able to answer any questions you may have so that you can feel quite comfortable with the idea of hypnosis and gain the maximum benefits of using this effective form of therapy with confidence and ease. These days, people are taking more responsibility for their own well-being. They look around and see a huge choice of practitioners. Why should they turn to a hypnotherapist? 1. BROAD SCOPE. Hypnotherapy can help with anything in which the mind has an influence so its range is far wider than is sometimes thought. Today's hypnotherapists work from an understanding of the mind and of the mind-body connection that is based on modern neuroscience. This enables them to work successfully with problems such as pain control, IBS and the stress/anxiety response as well as continuing to work in the more traditional areas of fears and phobias and habit control such as smoking and nail-biting. With the increase in obesity statistics in recent times, more and more people are using hypnotherapy to identify and resolve underlying psychological barriers to achieving and maintaining a healthy weight. 2. SCIENTIFIC BACKING. Hypnotherapy is supported by more scientific research than any other complementary therapy. (The Which? Guide to Complementary Therapies, 2002). 3. FAST RESULTS . Using a very light state of trance, similar to day-dreaming, or absorption in a book or TV programme, means that change can take place more quickly than with other therapies. This means treatment is often surprisingly brief, comprising only a few sessions. 4. TAILOR-MADE. Each client's perceptions and experiences are different so a well trained hypnotherapist will give you designer service, as opposed to off-the-peg. They will listen carefully to what is currently going on for you and what you'd like to change and tailor the techniques they use according to your unique personality and context. This personalised approach cannot be emulated via mass-market tapes or CDs. 5. HIGH STANDARDS. Hypnotherapists who are registered with a relevant professional association have received a high standard of training and work to a comprehensive Code of Ethics and Practice. They are also required to undertake ongoing professional development each year to ensure that they are continually refreshing and broadening their knowledge and skills.